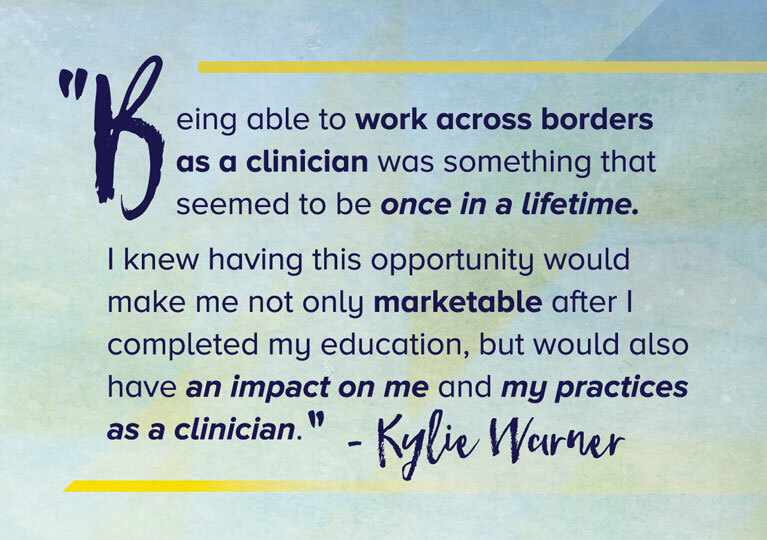 When looking into colleges, Kylie Warner knew one thing — she wanted to help others. Appropriately enough, it is the support she has received from Truman that will allow her to pursue her passion and make a difference in the world. As a first-generation college student, Warner chose Truman because it seemed unlike anywhere else. 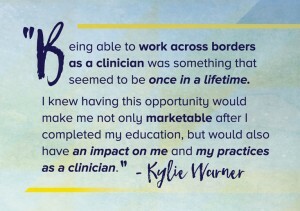 When starting college, Warner was uncertain of the career she wanted to pursue, however, she did know she was meant to work with people and make a difference. While her drive, intelligence and passion for her field have brought her this far, Warner could not have done it without Truman’s support. 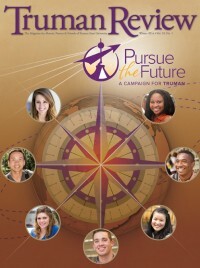 One particular scholarship provided Warner with a unique opportunity to use her passion to serve others abroad. 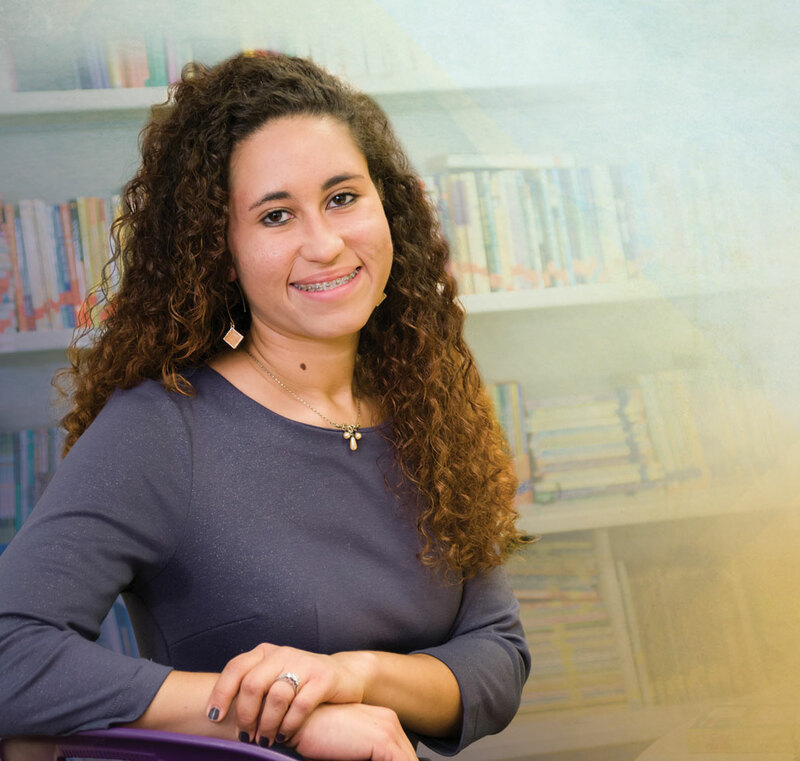 As a student with high aspirations, but supporting herself through college, Warner knew it would not be possible to go abroad without assistance. After applying for a Foundation scholarship to attend the 2015 Communication Disorders Experience in Mexico, Warner received assistance that paid for the trip in full. The intensive two-week trip encompassed a variety of opportunities serving populations of developing children and teenagers, as well as children with disorders including autism, cerebral palsy and other genetic disorders. The difference Warner would make during this trip was even greater than she expected. 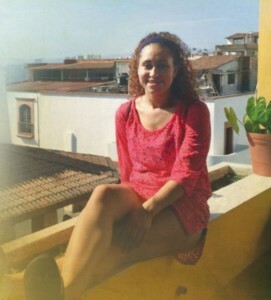 With Spanish as the primary language of her clients, Warner learned an important lesson about communication while abroad. Serving others is not only a huge part of Warner’s career, but is a value she lives out in her day-to-day life. In her time at Truman, she has been able to serve others through her involvement in the Communication Disorders Association (CoDA) and through her sorority, Sigma Lambda Gamma. Warner has volunteered regularly at nursing homes working with the geriatric population by hanging up door decorations, helping with odd tasks and just being a conversation partner. Warner knows for many students, herself included, a lack of financial support could have meant a completely different life track. Warner will graduate in May with her Master of Arts degree in speech-language pathology. After graduation, she hopes to find a job in a hospital or rehabilitation center working with people who have had traumatic brain injuries and strokes. As a Ronald E. McNair Scholar, Warner is planning to obtain a Ph.D. in speech-language pathology and wants to contribute to the field in the form of research. Through her hard work, diligence and an institution that believed in her, Warner’s goals and aspirations are becoming a reality. She hopes to eventually give others the same support she received. This entry was posted on January 13, 2016 by kbest.